Cockapoos generally weigh between 20 and 24 pounds (9 to 11 kg) and stand about 14 or 15 inches (35 to 38 cm) at the withers. Like their originating breeds, Cockapoos come in a variety of coat colors, both solid colors and combinations. 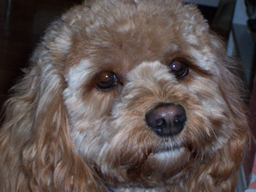 The general shape of the Cockapoo, in particular its ears, mostly resembles the Spaniel, but the coat and face are usually more reminiscent of the Poodle. They do not shed, are loyal, and don't cost more than a cat to feed. They are as odorless as a dog can be and they don't slobber. Cockapoos are well known for their loyalty to their owner, and are known to get jealous if he/she pays attention to anything else. Like most spaniels, they can be very energetic, but this can vary widely from dog-to-dog. They shed little to no hair. The Cockapoo is still under development. Strictly speaking, the Cockapoo cannot yet be described as a dog breed because it does not 'breed true'. In breeders' terms, 'breeding true' means that, when two specimens of the same breed are mated, the puppies have consistently predictable characteristics and will resemble their parents, rather than exhibiting random characteristics of the dog breeds in their parents' ancestries. Further, the breed standards of breeds-under-development are invariably freer, more open to interpretation and cover more observable types than those of established or kennel club recognized breeds. Prices current as of last update, 04/18/19 11:01am.